Law Enforcement Chaplains are available to sworn and non sworn department personnel and their families. They provide around the clock availability, accessibility and confidentiality. 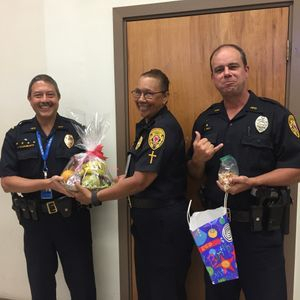 The County of Hawai`i’s Law Enforcement Chaplains primary objectives are to support law enforcement families in professional and personal times and serve the community of the Big Island of Hawaii in times of emergency and tragedies. Offer prayer at special occasions such as recruit graduations, awards ceremonies, blessings, dedication of buildings, retirement ceremonies.